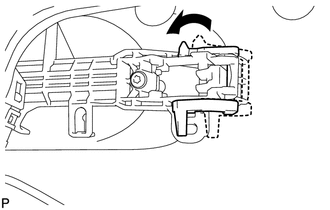 (a) Insert the front end of the front door outside handle assembly into the front door outside handle frame. 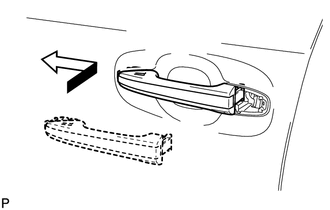 (b) Insert the rear end of the front door outside handle assembly into the front door outside handle frame, then slide the front door outside handle assembly toward the front of the vehicle to install it. 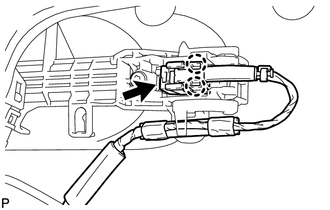 (c) Move the lever back in the direction indicated by the arrow in the illustration to lock the door outside handle assembly. (e) Engage the 2 claws.